Promise is a horse I had the privilege of communicating with and opens our story for this issue. Are you taking care of your pet, or is your pet taking care of you? Some humans tend to believe we are caring more for our pets than the care they provide for us. However, I’ve found, through communications, that relationships with our pets are mutually beneficial. 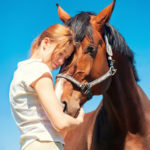 Pets provide support for us in ways both emotionally and spiritually. They fulfill a deep need within our heart and soul. Given this awareness, I’m going to highlight what Promise brings to the relationship with her person Jenny. Perhaps the whispers from your pets may be echoing something similar? I told Jenny, “Promise exudes an expanded energy field and is aware of her sense of self and purpose for being in your life. This purpose includes being proud of you and contributing to your growing confidence and feelings of significance. “Promise trusts you because you know what you’re doing. She wants any self-doubt you may have to fly out the barn door. She enjoys the beautiful tenderness that you bring to the relationship. She said, ‘At one time you went from feeling somewhat small to feeling as big as her. You came into your empowered spirit and are allowing it to flow as powerfully as a waterfall.’” Jenny happily agreed. “Promise says you learned how to serve her and through mutual respect your relationship glows with the spirit of cooperation. She went on to mention, her legs, stomach and body needed some attention.” Some weeks after our communication, Jenny learned that Promise had developed Cushings disease and is now treating her with medicine. Jenny questioned why Promise bolted away from the workers in the barn. Promise explained. One of the workers needed to clean Promise’s stall and she wasn’t cooperating. The worker took the handle of his shovel and tapped her hind quarters. He hit an area of her back which created an uncomfortable stinging sensation. Since then she’s felt afraid to interact with the workers. I apologized to Promise and expressed how sorry we were that this happened. Jenny was grateful to have more awareness about the bolting. When we finished our chat, Jenny said she got a lot out of it. She has an even deeper understanding and bond with Promise. Checking in with Promise, the feeling was mutual!